More power to Bill Leak. “Ridicule is mans most potent weapon.” Saul Alinsky. Whatcha gonna do about it Timmy? Whatcha gonna do about it Timmy? 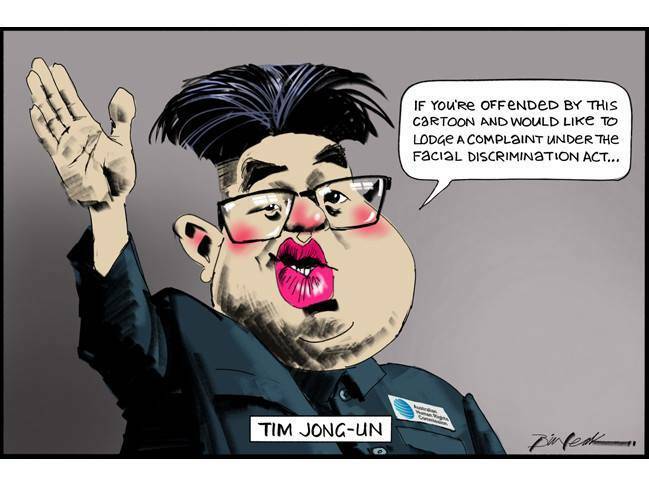 Fantastic to see Bill Leak applying rule 5 of Saul Alinsky’s “Rules for Radicals” and turning their own rules back on the left and their Dear Commissar, Tim Jong-UN .”..Ridicule is mans most potent weapon..” Alinsky observed in his “how to” handbook of the late 60’s. Bill Leak’s recalcitrance and disrespect for the Dear Commissar really puts Soutphommasane and the commission over a barrell and into a bind. If they ignore it and pass it off as frivolous and vexatious, they also have to ignore his previous personal and potent best of the indigenous cop and father of August 4 and write that complaint off as frivolous and vexatious as well. Or will they double down and compound their stupidity and have Leak shackled and hauled before the star chamber of the humourless race commissioner for bringing it into disrepute? Hardly, as Commissioner Tim, working as a tag team with the President Gillian Triggs have already dragged the commission into the swamp. With its reputation clapped out and in tatters, they have to ask themselves one question. Do you feel lucky, punk? Well do ya?